The DB400 Adhesive Die Bonder is a versatile, low cost entry-level system which is ideally suited for development and production batch work. A pneumatic traversing table supports both die presentation pedestal and workholder, providing fast but simple die bonding operations. For precise die alignment to within 0.05mm, both pickup and placement cycles can be viewed by the operator using a stereo zoom microscope. The pickup and dispense heads are mounted on precision Z-slides, for delicate die handling and adhesive dispense operations. The latter is controlled by a simple timer together with regulator controls mounted on the machine front panel, while the dispense cycle is activated by a foot switch. Die presentation is by means of a waffle tray holder which is manually aligned to the vacuum tool, ensuring accurate die pickup. The vacuum-locked shuffle workholder can accommodate flat substrates up to 102mm square, using a mechanical clamping device, and can be configured to hold most common packages. An optional heated workholder is also available for adhesive materials that require a background temperature of up to 250°C. 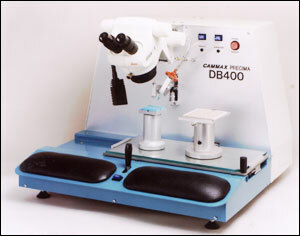 A dispense facility is fitted to the DB400 as standard to dispense adhesive dots from a syringe, prior to die placement. Syringe sizes of up to 10 cc capacity can be fitted and an optional low-volume reservoir is available.